Lan gets reprimanded by her dad for giving up Garaged’s project so easily and she goes crying to Pad. Pad brings Lan to Pim’s apartment and shouts at Pim to help but Pim ain’t budging. Don approaches Pim in her room and tries the soft approach instead. Sensing Pim’s hesitancy, Don carefully holds her hand in his. Pim looks at Don in silence but a small smile playing on her lips signals that the weight has been lifted off her mind. ‘When them siblings fight and be hurt, we have to allow them to be hurt to a point, when they will realise how much they love each other.’ Mom explains. Lol, Don comments that their style of family education is rather cruel but I think it makes sense for them because Mom and Dad are confident of Pim and Pad’s love for each other. The next day Sucee and two of Lan’s minions talk about her problem with getting Don as a presenter for Garaged’s product and Sucee lets slip that Lan is the daughter of a mia noi. This information is overhead by the cleaning lady and she decides to spread this gossipy piece of news. Khun Suk encourages Lan not to give up on Garaged’s project and that Lan should work hard for herself and not for her dad’s approval. Lan regains a bit of confidence at Khun Suk’s words but when she steps out, she hears her colleagues gossiping about her being a mia noi’s child and misunderstands that it was Pim who spread the news. Before Pim could explain herself, Lan’s dad first wife comes and scolds Lan in front of everyone. 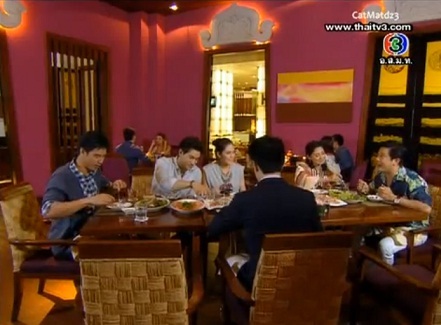 Khun Suk comes to Lan’s defence and manages to get the first wife to leave but the damage has already been done. Figuring that Pad is the source of her ‘identity leakage’, Lan looks him up and slaps him for betraying her trust. Pad knows he didn’t tell on Lan and since only he and Pim know about it, he comes to the conclusion that it must have been Pim. Pad calls Pim a poisonous snake for being so vicious and Pim retaliates by calling Pad a python who insists on coiling around a woman who doesn’t love him. Nasty words continue tumbling out of Pad’s mouth in the heat of the moment and when Mom and Dad returns home to break up the fight, Pim says she has nothing more to say if her brother really thinks so poorly of her. Don finds Pim crying in her room and tells her he knows she didn’t spread the gossip on Lan. ‘If you really did it, things will definitely be much more complicated because you can’t think easily. Sometimes I want to use your way of thinking in my novel.’ Haa, what a roundabout way of comforting someone Khun Don. But it works because we get a smile out of Pim. Turns out the cleaning lady has been bribed by Egapon to inform him of the going-ons in Naree but the days of the cleaning lady earning extra bits of cash is numbered when her phone call is overheard by Driwin. Pim is informed and she brings the cleaning lady to Lan where the cleaning lady confesses to spreading gossip on Lan and their misunderstanding is finally cleared up. Pim finally sorts out her thoughts and tells Don that she ‘allows’ him to be the presenter for Garaged’s product if he is willing. Don is happy to help out and Pim brings him to Khun Suk’s office to make the announcement just as Garaged is making things difficult for Lan. However, Garaged announces that she will be the leading lady for the advert with Don, much to Pim’s dismay. Lan thanks Pim for helping her and Pim tells Lan to return the favour by helping her keep an eye on Garaged when she films the advert. Haa, having Garaged come into the picture ain’t that bad after all, at least it finally gets Pim and Lan on the same page as they join forces to fight against the bigger bad Garaged and their partnership begins with confronting Egapon. Pim, Lan, Nen and Sucee get into an argument with Egapon but Don shows up in time to give him a good kick and send the nasty man on his way. Don sends Pim back to her office and reminds her of dinner with the family at a seafood restaurant later to celebrate the resolution of her misunderstanding with Lan. Mr. Shameless Driwin waltzes in and invites himself along too since Pim promised him a treat to thank him for finding the culprit! Grrr, I really really really dislike Driwin as you can probably tell already. He makes my blood boil every time he shows up. Don likes him about as much as I do but agrees to his shameless self invite through gritted teeth. Heeh, no worries Don, you have a big fan base in Pim’s family to help you ward off leeches. Dad, Mom and Pad take turns taking digs at Driwin over dinner even when he starts on his sob story of being an orphan. I’m not sorry for Driwin at allllllll. You and I know Don is Pim’s fake husband but Driwin doesn’t. His understanding of Pim and Driwin’s relationship is that they are a legally married couple who appears perfectly happy together so why on earth is he still trying to get between them???? Isn’t he just asking to be insulted by Pim’s family? Don acts possessive of Pim in front of Driwin but once Driwin leaves, Don walks away angrily. Back at home, Don is not his usual attentive self to Pim and Pad tells Pim to apologize to Don. After much prodding from P’Pad, Pim goes to her room and apologizes to Don for making him jealous of Driwin. Aware of how it sounds, she quickly adds that it’s because it will cause their plan to be exposed. Pim hesitates and perhaps afraid of hearing the answer from her mouth, Don says it for Pim instead. Don tries to hide his disappointment by shooing Pim to go for a shower while he continues watching tv nonchalantly. In the bathroom, Pim talks to her reflection in the mirror. Another accidental run into each other’s arms as Pim comes out of the shower! Haaah, they hold onto each other for wayyyy longer than necessary. When they finally regain their senses, Don escapes to the bathroom while Pim jumps into bed in embarrassment and forlornly reminds herself again that nothing will come out of her relationship with Don. The next day Don is supposed to go for the advert’s filming with Pim but Min rushes to Pim’s apartment in the morning, bringing news that Grandma wants to meet Pim’s parents. Pim’s parents decide to go there and then, and so the entire brood heads over to Grandma’s house. Don is worried but Mom and Dad assure him they are no push overs and walk in, ready for battle! Haaa, we see where Pim gets her sharp tongue from when Mom and Dad start on their tag team act, rebutting each of Grandma’s snide remarks with an even more sarcastic one with a huge smile on their faces. Knowing Pim and Don have work waiting for them, Mom and Dad shoos them off after round 1 with Grandma. By now Grandma doesn’t even bother with the niceties and says plainly that she will never approve of an easy woman like Pim who isn’t of noble blood. Grandma though is not impressed and vows to rid Don’s life of this family.